Tarntoul: Torr an t-sabhail, " Knoll of the barn." While the north east side of the Buchat Water upstream from the church still is actively inhabited, on the other side, the south west side is much more sparsely inhabited. There were however in the past two crofts at Tarntoul and the neighbouring Tullocharroch. Opposite Altnacraig cottage there is just visible the remains of a gable from one of the buildings at the farm at Tarntoul. “Up to the middle of the 19th Century the people lived for the most part in clachans, irregular groups of 10 – 20 “Fire Houses” that sheltered, very indifferently, as many families, usually related. |The houses were set down anyhow in a group, and were built partly of stone with lime and clay and having thatched roofs. Hovels still more wretched made of “divots”, chiefly provided for the “bestial”. The principal clachans were Easter Buchat, Beltamore, Belnacraig, Belnaboth, Upperton, Peatfold and Badenyon, but they are rapidly disappearing, being replaced by the houses erected by the new laird, who has already built or reconstructed over twenty. This farmstead is situated in rough pasture at the foot of the NW flank of Stony Hill. On the 1st edition of the OS 6-inch map (Aberdeenshire, sheet lx, 1869) it is depicted as comprising an L-shaped range, with what was probably a cottage a short distance to the N, and another detached structure to the SE. By the end of the 19th century (OS 6-inch map, Aberdeenshire, 2nd edition, sheet lx, 1903) the range was still roofed, but the cottage and the detached building to the S were roofless. Today, nothing is visible of the cottage and, with the exception of a short stretch of walling (0.6m thick and 2.7m high) at the N end of the range, the rest of the farmstead has been reduced to grass-grown footings. The range comprises two conjoined buildings, one a possible L-shaped barn on the N, and the other a two-compartmented structure to the S. The barn measures 13.6m from N to S over walls 0.6m in thickness and re-entrant angle is on the E; there is a possible wheel-pit set against the outside of its N wall although there is no visible source of water to supply it, and none is shown on either edition of the OS map. The second building on the S measures 14.2m from N to S by 4.9m transversely overall, and has entrances in the E side. The detached building lies close to the SE corner of the range and measures 8.8m from E to W by 4.9m transversely overall; and there is an entrance on the S.
Visited by RCAHMS (JRS, ARG), 2 October 1998. The remains of this limekiln are situated at the edge a N-facing terrace immediately N of a rough track which passes through a coniferous plantation on the lower, NW flank of Stony Hill. Its site is marked by a semi-circular depression, measuring 5.5m from NE to SW by 3.6m transversely and up to 0.25m in depth, at the crest of the slope, and by a tumble of stones and boulders running down the steep slope into the trees. The kiln is depicted on the 1st edition of the OS 6-inch map (Aberdeenshire, sheet lx, 1869), and is annotated Old Limekiln on the 2nd edition of the map (sheet lx, 1903). The occupants of Tarantoul and surrounding farms had some nefarious activities in the past. For full details of Beattie family click this link Beatties of Glenbuchat . There are Beatties at Tarntoul from at least the 1720s. Recorded Beattie births there end about 1796. At least two of the Beattie brothers moved to Cabrach, where there are recorded births starting around 1816. 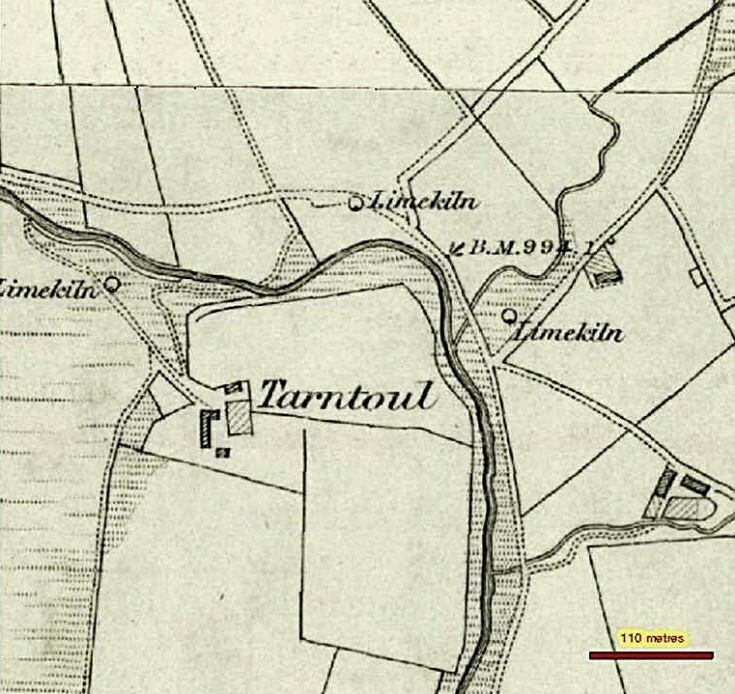 By the 1841 census, the Farquharson family has replaced Beatties at Tarntoul. Another son, or perhaps a brother? Eldest son, given that he is the one who continues to reside at Tarntoul? Tarntoul Jean Beattie CHR - 14 Sep 1742 Baptized JEAN dau to John Bettie in Tarntoul mar to John Beig, above? William Beattie CHR - 2 Sep 1744 Bap WILLIAM son to John Bettie in Tarntoul. John Beattie CHR - John Betty chr 05 DEC 1746 Glenbucket [Decr 5 bapt John son to John Beity in Tarntowle] John B. Elder from Netherton? Adam Beattie CHR - 20 Dec 1748 - ADAM son to John Bettie in Tarntoul. James Beattie CHR - 1751 Aug 6 - Bap JAMES son to John Bettie in Tarntoul. + Isobel Bain CHR - 30 September 1790 Powneed, Cabrach, daughter of William Bain and Beatrix Gordon D - 5 Feb 1883 [MI] Isobel in household of son James at Powneed, Cabrach in 1881. Alexander Beattie CHR - 22 Mar 1790 Glenbucket "James Bettie in Tarntoul & Ann Murrain his spouse had a son Baptized called ALEXANDER before witnesses John Bettie senior"
+ Margaret Reid Margaret Reid was born about 1795 in Inveravon, Banffshire. She died 24 APR 1865 at Todholes Cabrach. Adam Bettie CHR - 1796 [aft Dec 11]. James Bettie in Tarntoul had a son baptized Adam before witnesses. Mother's name Elspet Smith. (Glenbucket) [also appears as "James Bettie of Tarntoul had a son Adam bap. (unreadable) 1796"]. kirk session (excerpts): 1799 July [...][...] Minr & Elders compeared Elspet Smith a young [...] from the parish of Inveraun who had been servant te [...] Bettie some time ago a married man in this parish [....] 1800 January 12th. James Bettie appeared before the Congregation for the sin of Adultry with Elspet Smith had been before the session three sabbaths before & this day was absolved as a Commutation for his crime. D - [probably] 25 Mar 1869 District of St Nicholas, Aberdeen. On death registration parents are listed as John Beattie, farmer (reputed father) & Isabel Smith Domestic Servant (both deceased), which, while not correct, does match the general names and circumstances of Adam's birth quite well. Corroborating the identification is the 1851 census, which shows Adam as born in Glenbucket. Catherine Farquharson my ggm was born in Glenbucket in 1833 the daughter of James Farquharson & Isabella Forbes. In Tarntoul Glenbucket 25.5.1854 she married Charles McHardy from Stratdon. On 7.11.1854 Catherine & Charles sailed from Plymouth aboard the "Amazon" as assisted immigrants for Melborne Australia.Employment was arranged with a Mr Farquharson, Keilor Vic.